Our first trek was the Ancient Forest, 113km East of Prince George. This is the only known inland rainforest in the world and thanks to thousands of volunteer hours, the entire trail has a wooden boardwalk, and long, wide, flat sections suitable for wheelchairs and mobility devices. The trail is an easy-moderate hike marked with interpretative signage, and is home to a beautiful waterfall. In 2016, 11, 190 ha of the Ancient Forest was designated as a Class A Provincial Park and given an additional name, Chun T’oh Wudujut. Teapot Mountain Recreation Park is north of Prince George 50km past Summit Lake. The hike is a short but steep (and hard!) but only for about 1km (straight up hill – there’s even a rope to assist your ascent at one point…) until you reach the summit. There are four viewpoints providing 360-degree views of the surrounding lakes, rivers, forests and wetlands from the top. The hike is worth the view, there are even teapots placed by some hilarious hikers along the trail to compliment the name of the mountain. Two well-known city parks are Cottonwood Island and Lheidli T’enneh Memorial Park, and both are part of the 30km Centennial Trail. The parks are located on the banks of the Nechako & Fraser Rivers and allow for some wonderful human-wildlife interaction. We had the unique experience of having fledgling chickadees land in our hands to eat sunflower seeds in Cottonwood Island. There are also unique spirit faces carved by local artist Elmer Gunderson in some of the trees throughout the park for added entertainment. Lheidli T’enneh Memorial Park is one of the City’s signature parks, including the Rotory Spray Park, a playground, the Exploration Place, and the Lheidli T’enneh burial grounds. We had the great pleasure of being escorted through the Great West Life Mobility Trail by Ken & John, two dedicated local volunteers who are devoted to developing and managing the trails throughout the Tabor Mountain Recreation Site. The access to this trail is located off of Highway 97 south on Buckhorn rd. I loved the off-roading portion of this trek, through the Jack Kinsey Crossing (a metal bridge we had to duck to get through!) and up to the Yamaha Cabin where we had a great view and a good spot to stop for lunch. There is 407km of trail system included within the Tabor Mountain Recreation Society boundary, obviously too many trails to trek in one day, but a lot of miles can be covered on an all terrain vehicle! UNBC Continuing Studies Coordinators Rob and Brock, took us out the historic Fort George Canyon by Jet Boat, which they called “our secret mission”. 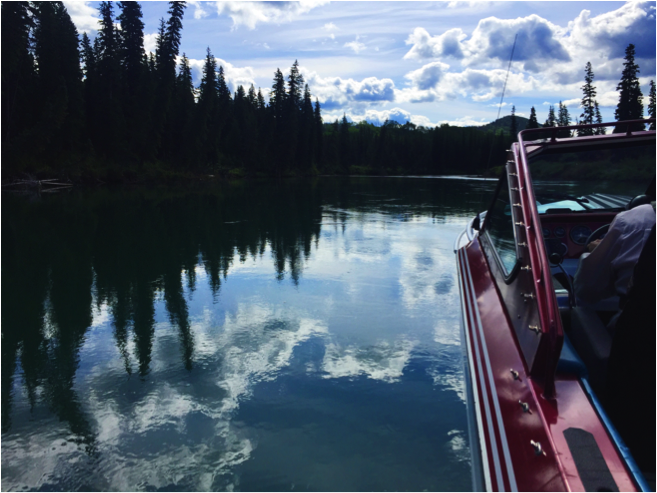 What a day for a jet boat — the weather turned out beautifully and we got to catch a black bear, coyote and eagle on camera. This journey is superb by jet boat because you get a view from a new perspective, being on the water as opposed to hiking along the rivers edge. Fort George Canyon Provincial Park is rich with local history, it was once known as the highway in and out of north central British Columbia and the canyon was an obstacle many sternwheelers faced, forcing them to navigate dangerous rapids, whirlpools and massive jagged rocks. If you get an opportunity to go on a flight seeing tour in the Northern Rockies – TAKE IT! The flight from Muncho Lake to Mayfield Camp with Liard Air was one of the most incredible experiences of my life. While I have driven the Alaska Highway many times, the view from the air is a completely different experience. The size of the mountain range, the valleys, rivers and insanely blue lakes are absolutely breathtaking! 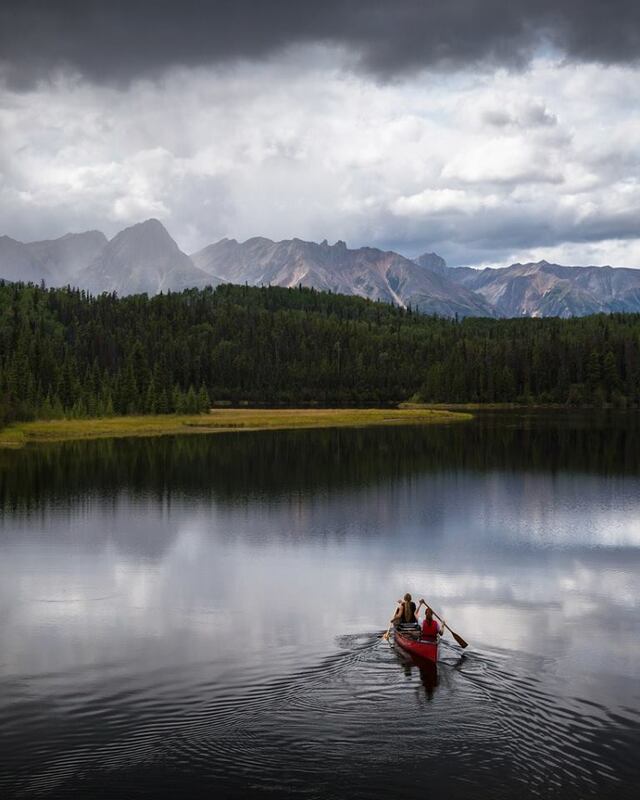 Arriving a Mayfield Lake – the Muskwa-Kechika Adventures Camp - I immediately knew I was in for an adventure different from anything I have ever experienced. Wayne Sawchuck and his crew welcomed us with open arms and the camp, while rugged, was well stocked and maintained – I know because I was a little short on gear! The first night we went on a horseback ride down to the Gataga River where we watched the sun begin to set, before making our way back to camp. The day was complete when our crew lit a fire and crawled into our teepee for the night – an incredible first day at camp. The next morning we set out on a full day adventure horse-packing, bush whacking and slowly made our way up to Shoulder Mountain Alpine Camp. Now, I am not really a horse gal (never have been), but I was pleasantly surprised by the good nature of all of the camps horses, who not only hauled out team up the mountain but even the Google Trekker got its own horse! It was a long haul but the view at the top was well worth it! The atmosphere was incredible up there; I’ll never forget how the sky looked as a storm circled the mountain, leaving the sun on us alone as is swallowed the valley below us. It wasn’t just the horse packing, good company and views that made this an incredible adventure but the ‘down time’ spent hiking around camp and exploring Mayfield Lake by canoe. This is an experience I’ll never forget and I hope that I’ll be able to go back someday soon! Tumbler Ridge was my first adventure with the Google Trekker and it was incredible! Tasha and I arrived Sunday afternoon and immediately went hiking with Sarah Waters from the Tumbler Ridge Global Geopark. She was an amazing host and showed us around all week. The TR Point Trail was a beautiful afternoon hike overlooking the Flatbed and Murray River Valleys and is approximately 4km long. The following day we took the Trekker on a jet boat tour with Wild River Adventure Tours up the Murray River to the bottom of Kinuseo Falls in Monkman Provincial Park. The trip up the river was already beautiful, but the sight of Kinuseo Falls is incredible. With this waterfall being taller than Niagara Falls, it is such an impressive sight to see and experience. Later that day we went and visited the Cabin Pool Trackway, an approximately 2km long hike where you can view dinosaur footprints! They are located all along the bottom of the trail and really give you a sense of how large the dinosaurs were. On Tuesday we helicoptered into a few more remote locations that can accessed from Tumbler Ridge, including the Cascades, Monkman Lake, Monkman Tarns and Wapiti Lake. We were trekking alongside of amazing waterfalls. The Cascades are a series of stunning waterfalls and some of the ones that we captured with the Google Trekker were Brook, Monkman, McGinnis, Lower and Upper Falls. My personal favourite was Monkman Lake. Its location is remote and it's a 25 km hike to the hidden lake, surrounded by mountains. The view from the campsite is like nothing else, and reminded me of a larger Lake Louise -- but without the hotel and all the tourists. Our third landing of the day was Monkman Tarns which is a sub-alpine plateau region along Monkman Memorial Pass Trail. The fourth landing was at the cabin at Wapiti Lake which is located at the inlet to Feller Lake as well has some open beaches along the trail. Some easy hikes with great rewards. A new favourite hiking destination! An initiative of Northern BC Tourism, in partnership with Google and Destination BC.